From the maker's of the HIT games "make Froyo!" and "Your Teddy Bear" and "Make Pizza!"! Monkeys monkeys everywhere!! Let's all work together to create a million different monkeys!!! Your Monkey, your Style! Paint your monkey any way you want, pick a fun face for him, then dress monkey up however you want!! Lots of styles for you to choose from! You can even paint your own clothes on monkey! Once you are done you can take a photo with monkey or send monkey to your loved ones or even share monkey on our Monkey Gallery and see if you can get lots and lots of LIKES! * This is the FULL version. All content is unlocked forever! - Take a photo with Monkey! - Monkey Gallery to share monkey with people around the world! - Create and email a monkey to your friends and family! - iPhone 5 widescreen support! 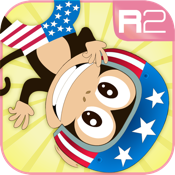 - Create and dress up monkey however you want! - 100s of items for you to create with! - Post your monkey to facebook! - Post your monkey to Instagram! - new furs, new body parts, new clothes and new props to be added with every update!